NES The Addams Family (USA) in 13:43.32 by Walker Boh. 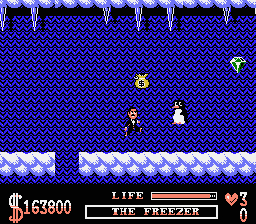 This extremely difficult game is about Gomez Addams, who must rescue his wife and other family members from evil kidnappers. In addition to this, he has to collect one million dollars to be able to get through the security door in the basement. The game is very badly programmed and you have to avoid objects by afar to avoid getting hit. If you are wondering what some of the items or detours are for, read the author's comments at the submission page. This is the author's 8th version of this movie. Note: To play the .FCM file, you must use an old FCEu version, 0.98.12. It is available for download here.